The seals of Waxham Beach in Norfolk are facing a deadly new predator. It attacks when they least expect it, wraps itself around their necks and slowly but surely strangles them to death. This threat is so fatal precisely because evolution never prepared them for it. What is it, you ask? Plastic. 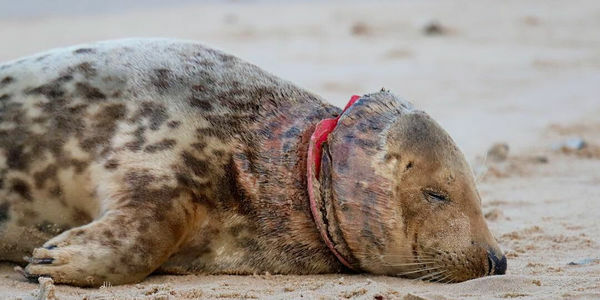 According to Friends of Horsey Seals — a local seal rescue charity — plastic waste on UK beaches have hit record levels. Thus there's a growing number of seals that have come to shore recently with plastic material wrapped around their bodies. Whether it's an old frisbee, fishing line, netting or a plastic bag, once the plastic gets around the animal's body, it slowly tightens as the animal grows, cutting deep into its skin, hindering its mobility, causing infections and resulting in a slow and painful death. That's what would have likely happened to Pinkafo — the female seal pictured above. If Friends of Horsey Seals hadn't rescued her in time, she would have eventually died an agonizing death, painful and unrelenting as the frisbee slowly dug into its skin. Luckily, she is now being nursed back to health, although it will be months before she is completely healthy. Despite being ahead of the pack in terms of anti-plastic policies, UK beaches are still inundated with plastic debris. Debris that often ends up around the necks of marine animals. So while last year, the government announced that they were banning single-use plastic items like drink stirrers, straws, and cotton buds and have implemented a 5p bag charge that has reduced plastic bag usage there is still more they can do to help end their plastic addiction. One thing they could do is ban single-use plastic bags altogether. Over the past several years governments as disparate as Rwanda, Kenya, California and Washington D.C. have implemented plastic bag prohibitions with stunning results. It's now time for the UK to do the same. Tell the government you want them to take action to fight their plastic addiction. Sign the petition and tell Parliament to #banthebag.